Sushma Swaraj met her counterparts from Saudi Arabia, Brazil, Mexico Morocco, San Marino and Moldova. Sushma Swaraj with San Marino FM Nicola Renzi. United Nations: External Affairs Minister Sushma Swaraj on Wednesday held meetings with her counterparts from six countries on the sidelines of the UN General Assembly session here and discussed bilateral cooperation. Continuing with her intense diplomatic engagements, Ms Swaraj met her counterparts from Saudi Arabia, Brazil, Mexico Morocco, San Marino and Moldova. 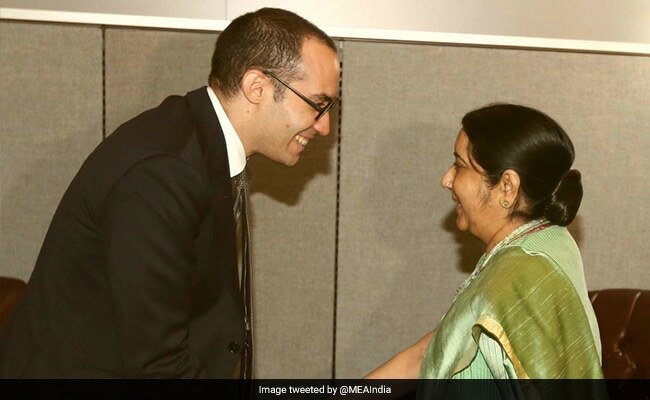 "The third day of intense diplomatic engagements begins as EAM @SushmaSwaraj meets with San Marino FM Nicola Renzi," External Affairs Ministry spokesperson Raveesh Kumar tweeted. After Ms Swaraj met her Saudi counterpart Adel Al-Jubeir, Kumar said, "Enhancing relations based on centuries old economic and socio-cultural ties." "Furthering ties with Eastern European friend EAM @SushmaSwaraj holds talks with Moldova DPM & FM Andrei Galbur," he tweeted. "Strengthening strategic partnership between India and Brazil", Mr Kumar said in a tweet as he posted a picture of Ms Swaraj meeting the Brazilian Foreign Minister Aloysio Nunes Ferreira.